Known better as Paris, this imported warmblood gelding is a powerhouse. He joined Georgie Harvey's team in July 2009, having been sourced by Julia in New Zealand while she was there earlier in the year for the Horse of the Year Show. Julia thought he was a stand-out. Paris is a Dutch Warmblood (Nimmerdor-Habitat/Avignon), originally imported by Claudia Hays and her family, who live on the South Island. He was jumping successfully at Grand Prix level with Claudia before moving to Australia. 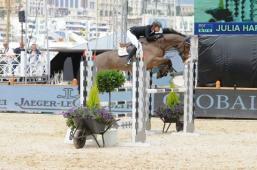 Now resident at Stal Tops, Paris is a beloved fixture on Julia's competition team. He is rarely out of the placings and a wonderfully reliable performer.